Easy hike which follows along overlooking the main road and campground. If you need to go to the HQ this is better than the road. A beautiful 65 degree sunny day which started out at 35 degrees. Beautiful scenery abounds on this hike. At this time the creek was not flowing so it was easy to cross. The trail is rocky and sturdy hiking shoes are reccommended. The Trail ascends 700' to the 4 mile loop which is fairly level with minor ups and downs. If you turn left at the intersection with the loop there is little to no shade for a couple of miles. If possible this could be done before the temperature rises. I took a 3 liter camelbak and drank half as the temp was very pleasant. This was a great hike very scenic and serene. The Sheep Pen Trail 2.5 miles has 3 Limpia Creek crossings. In the summer during the rainy season the creek will have 6" to 1' of water at all three crossings. After this there is a 700' ascent through a few long switchbacks to the loop. If you turn right at the loop intersection there will be a cistern at about a mile which will need to be filtered. If you turn right the vista 5700' is 1.5 miles. It was 75 degrees and sunny this day. I took a 3 liter camelbak and drank most of it. Well worth doing. We (6 of us) started our hike at the CCC overlook near the borders of Davis Mtns SP and Fort Davis Historic Site. The morning was beautiful but when the sun arose it got warm (as it always does)which made for a little difficulty on returning.. This hike offered some different views of the Davis Mtns and an educational overlook of Fort Davis whih is among the best prserved forts I've seen. This hike is pretty rugged, but that usually translates to some very good photo opportunities. The morning was cool and low clouds. 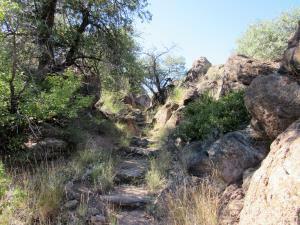 We hiked as a group of 8 as we ascended the Montezuma Quail Trail from the campground area. This was a steep climb or descent depending on which way you are hiking. This would be the only challenging part of the hike as the indian Lodge Trail is more flowing with ups and downs. The are views that shouldn't be missed. And the vegetation some of which is unique only to the Davis Mtns. and the Big Bend area.